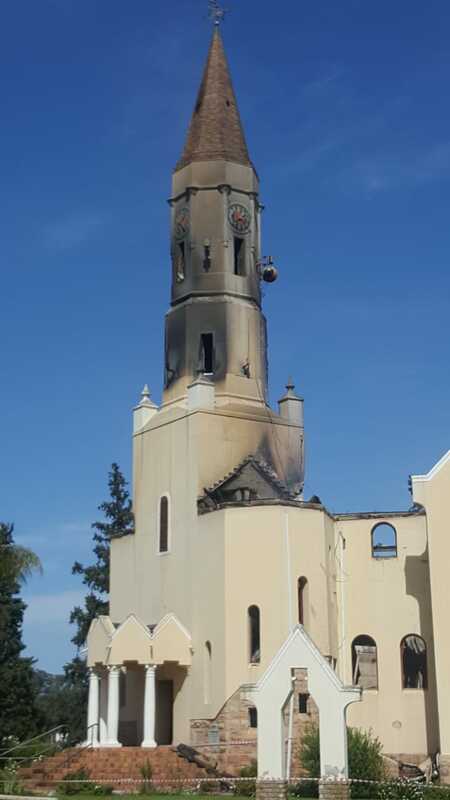 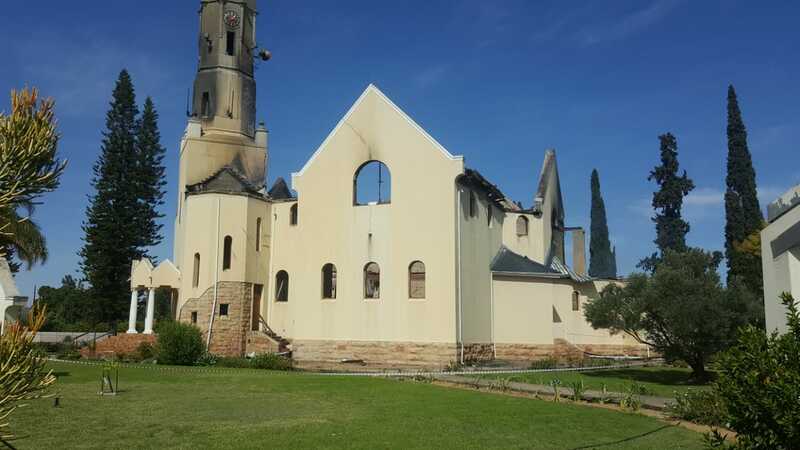 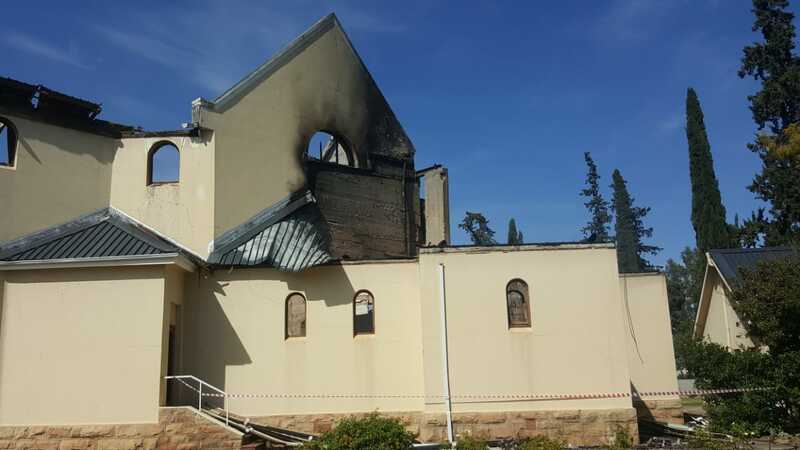 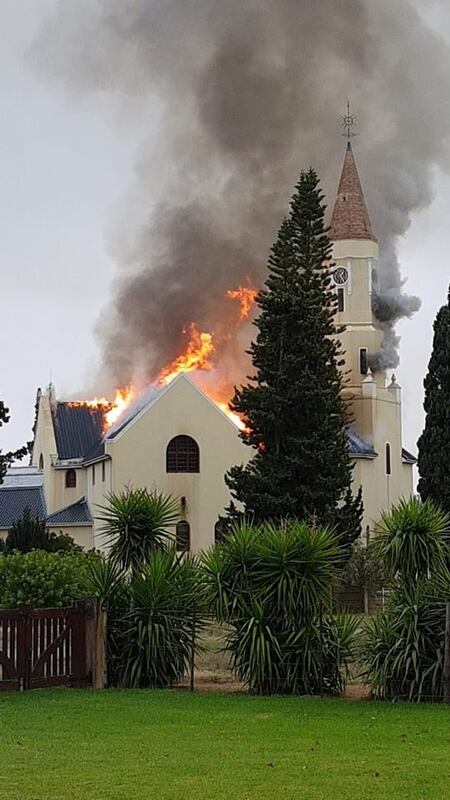 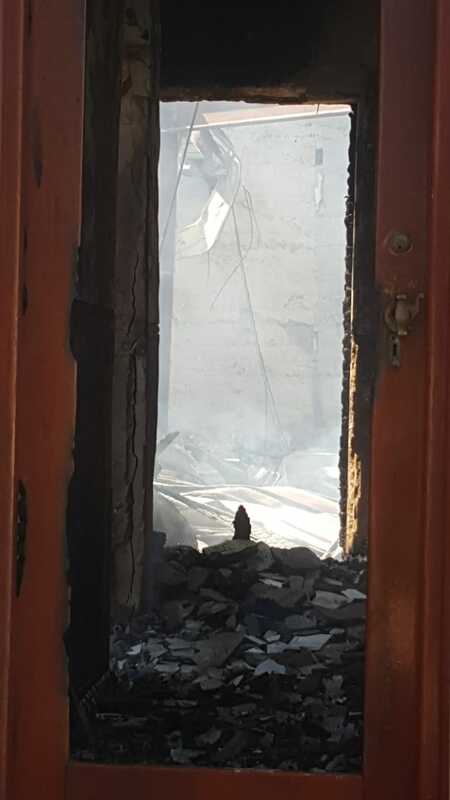 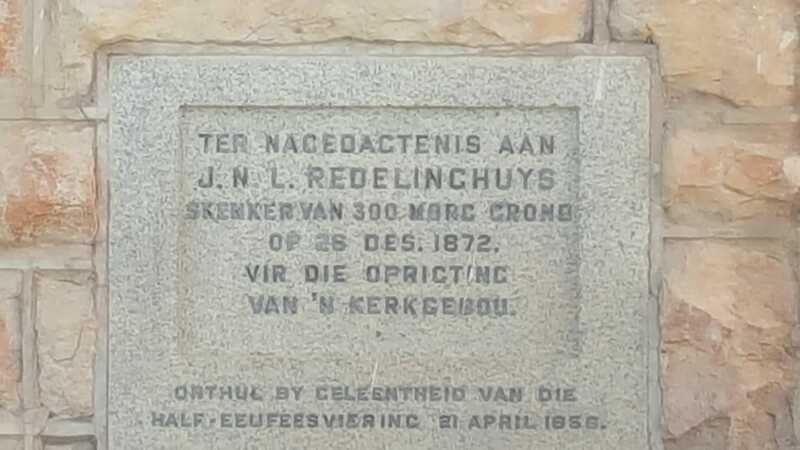 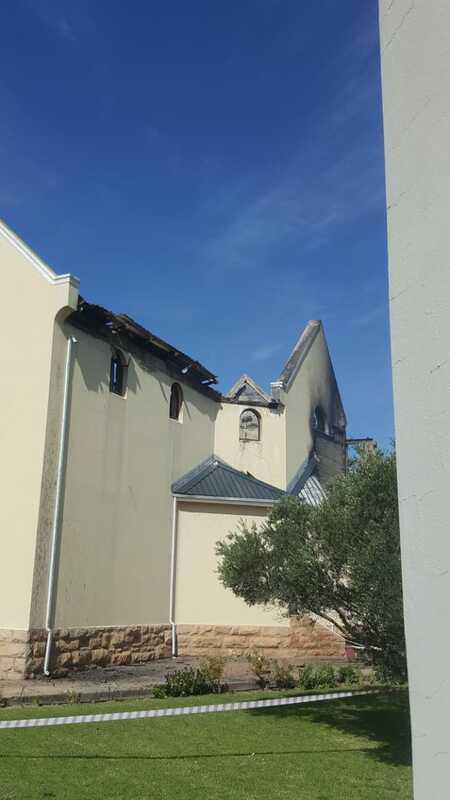 ​A Dutch Reformed church in Redelinghuys, a village in the Bergrivier Local Municipality in the Western Cape, about 160km north of Cape Town, was completely destroyed in a fire on Tuesday morning, 9 April 2019. 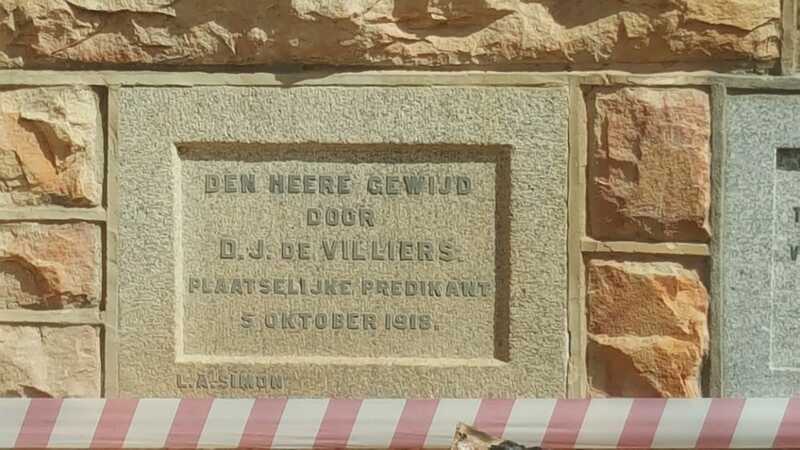 The church's cornerstone was laid in 1918. 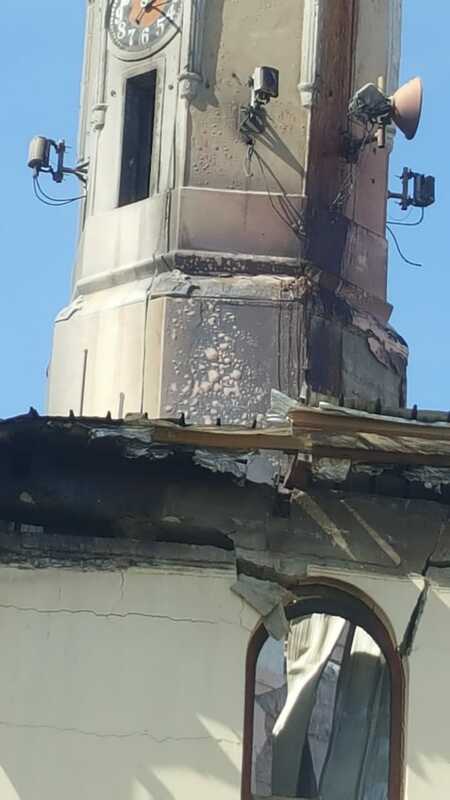 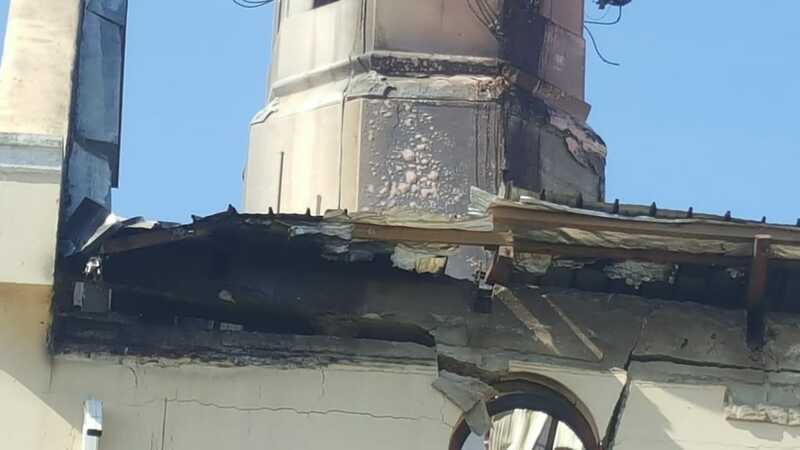 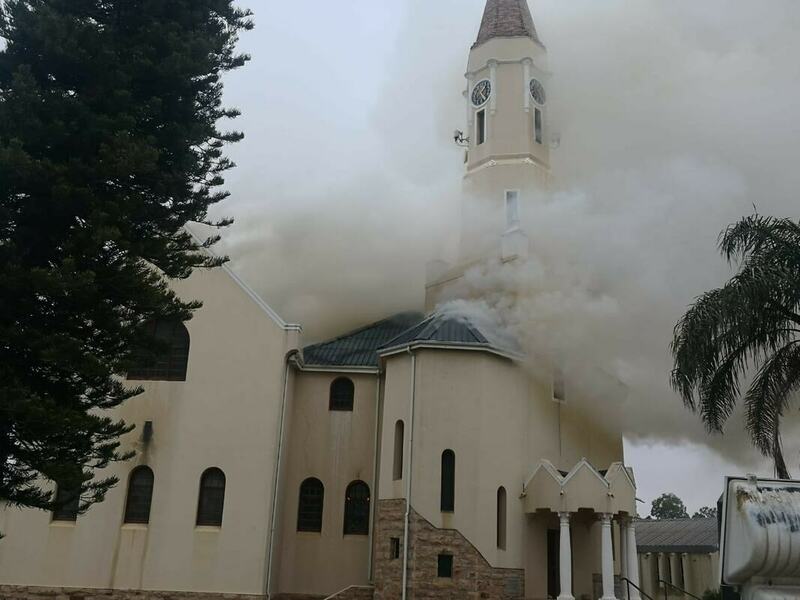 Bertus Senekal, chief fire officer of the West Coast District Municipality, said that emergency services had responded to reports of a fire at the church at 7h23. 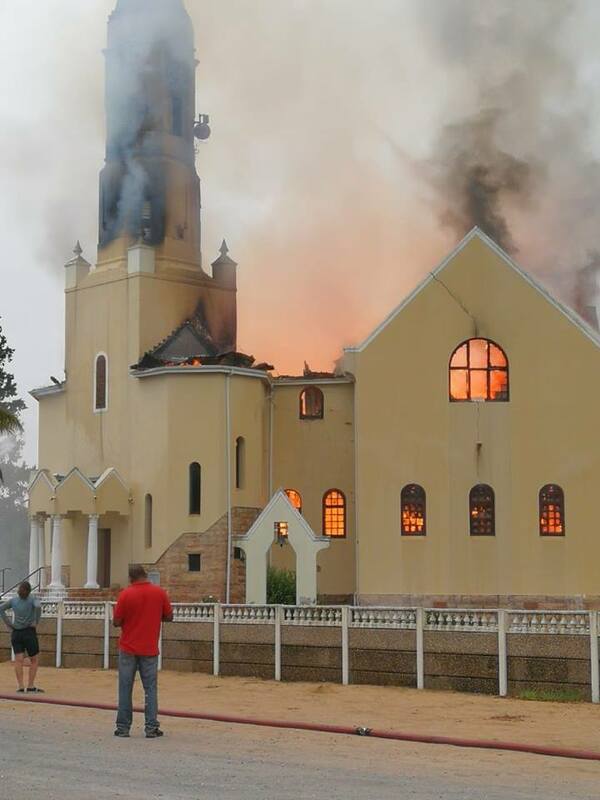 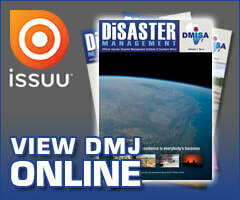 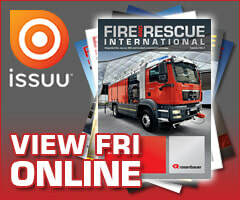 "When we arrived on the scene, the church was engulfed by flames. 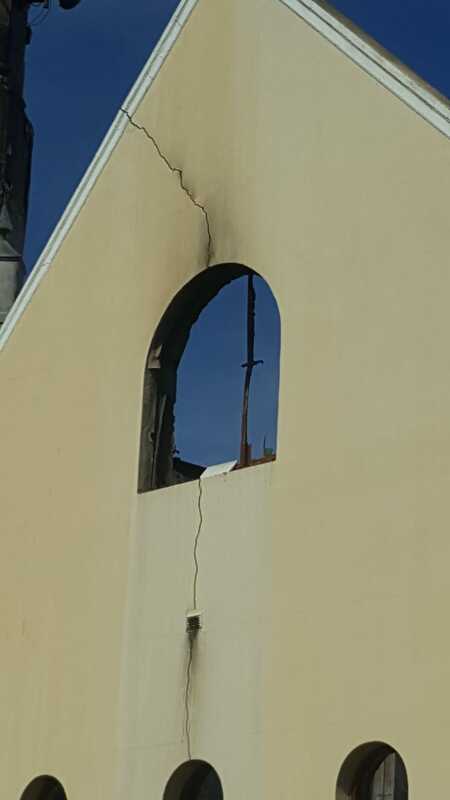 Because of structural damage caused by the fire, it was considered unsafe to enter the building, so we tried to extinguish the fire from the outside." 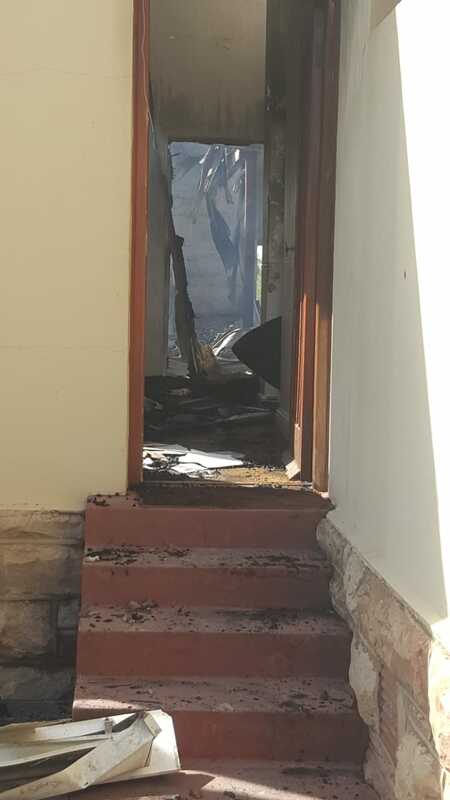 Piketberg Fire Station responded first, with a major pumper. 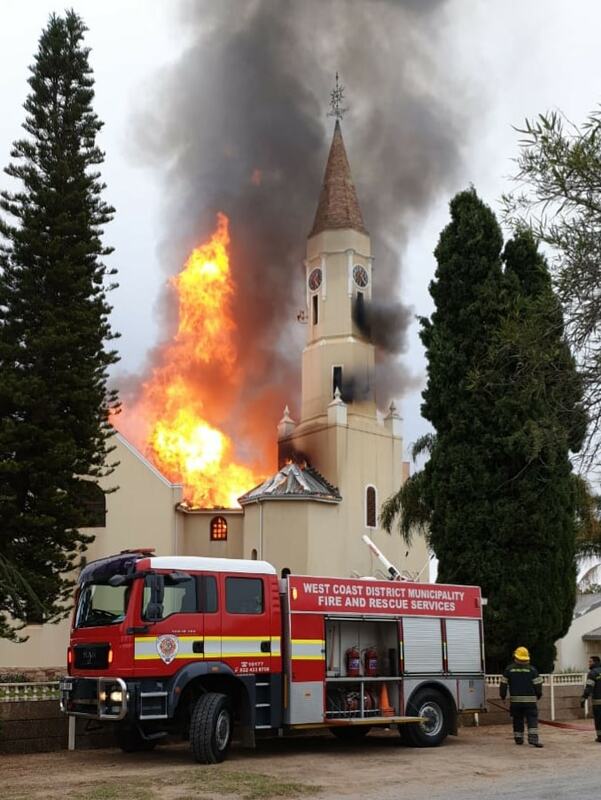 They were backed up by a crew from Clan William Fire Station with a medium pumper and a water tanker. 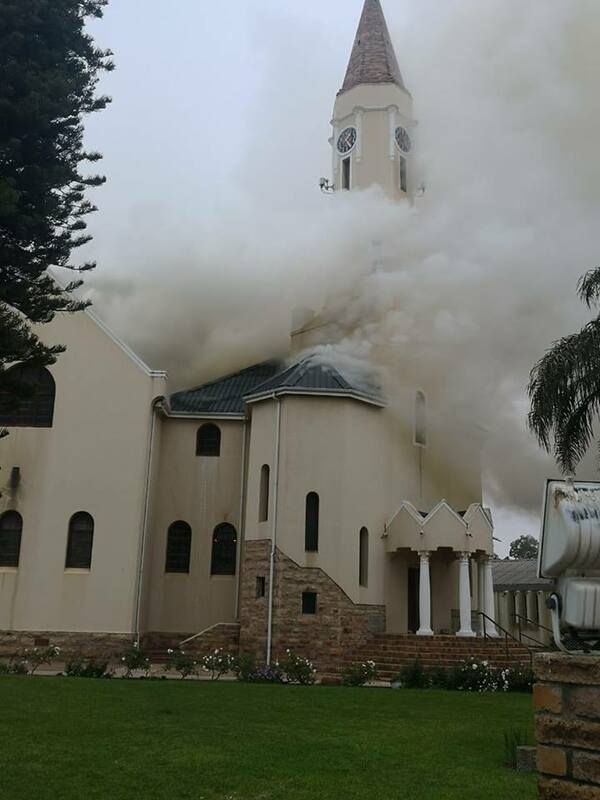 12 fire fighters were on the scene. 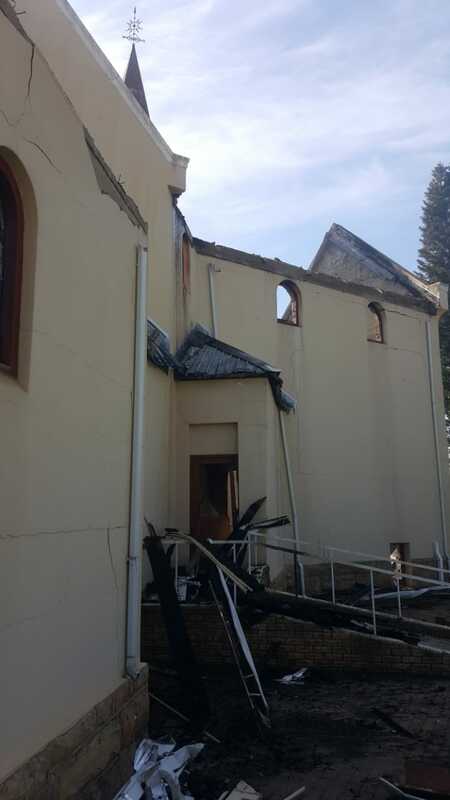 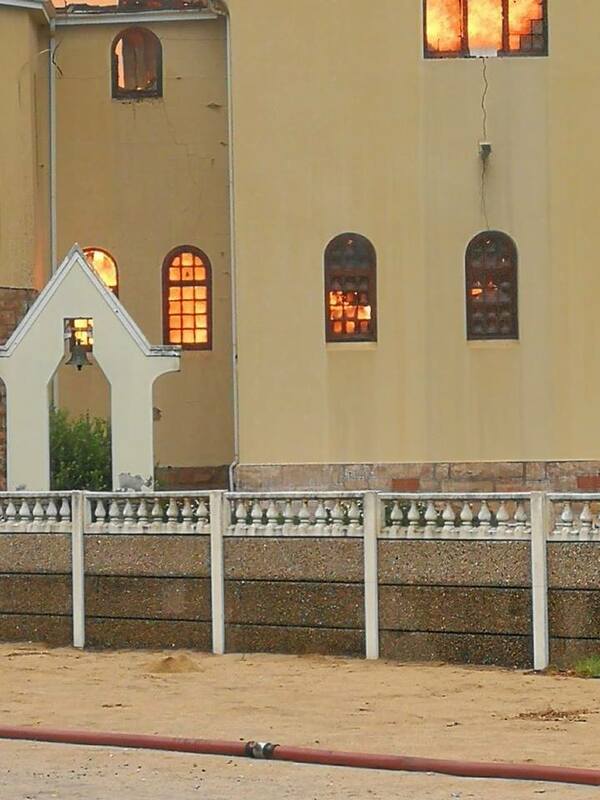 Senekal said the church building was completely destroyed, but no one was injured. 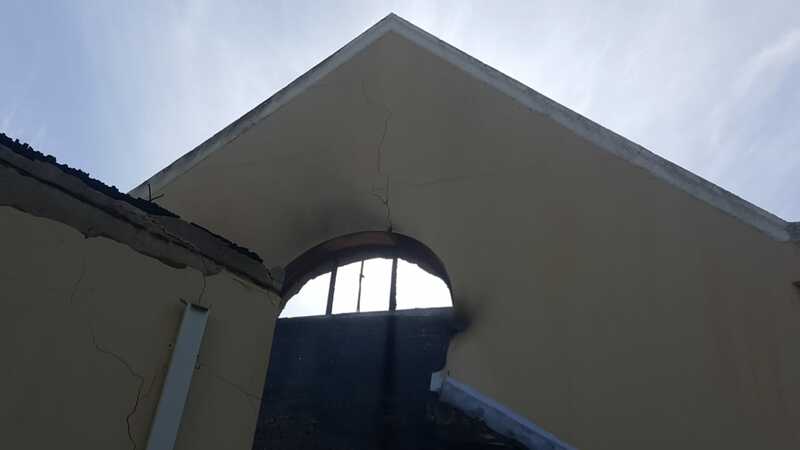 "We are now waiting for forensics to establish what had caused the fire. 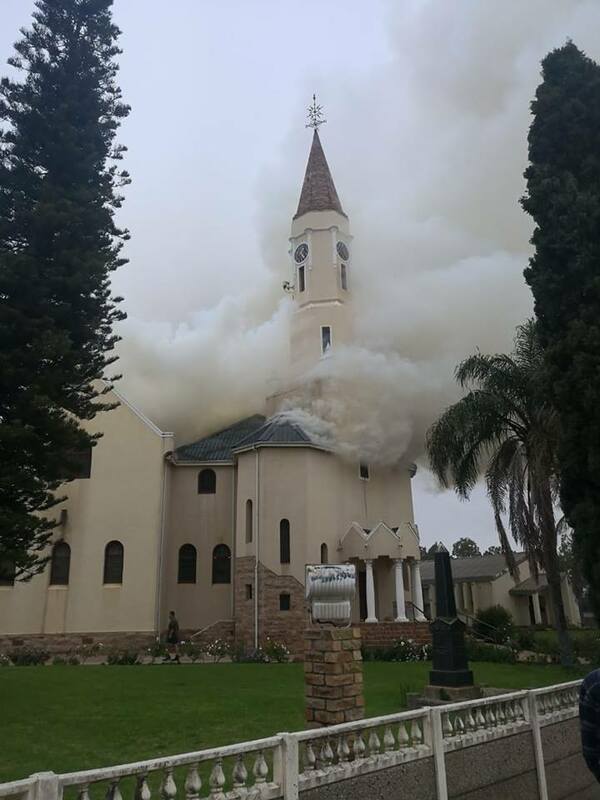 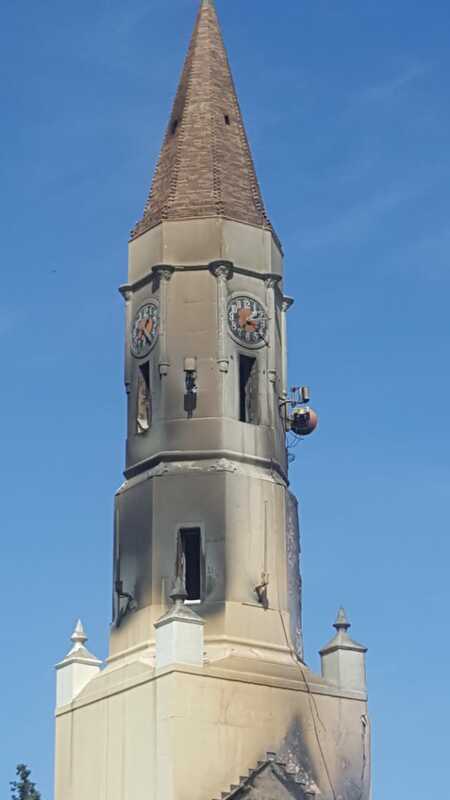 But eyewitnesses reported that they had seen smoke billowing from the church tower earlier this morning. 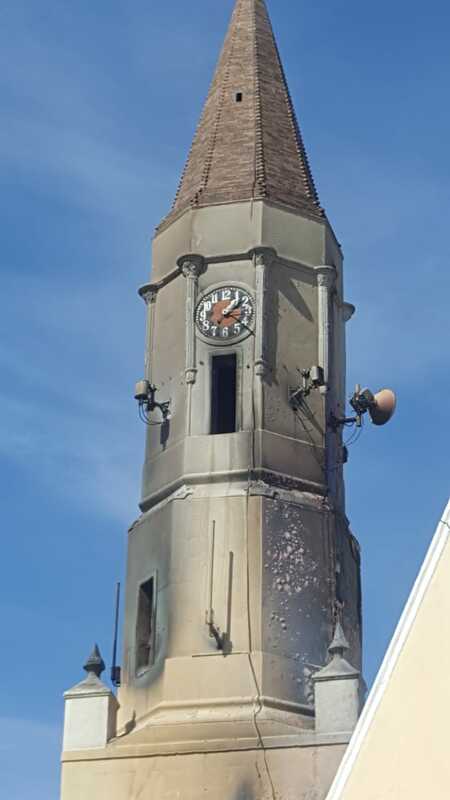 So speculation would have it that there could have been a short-circuit in the tower, as it houses cellphone-related equipment." 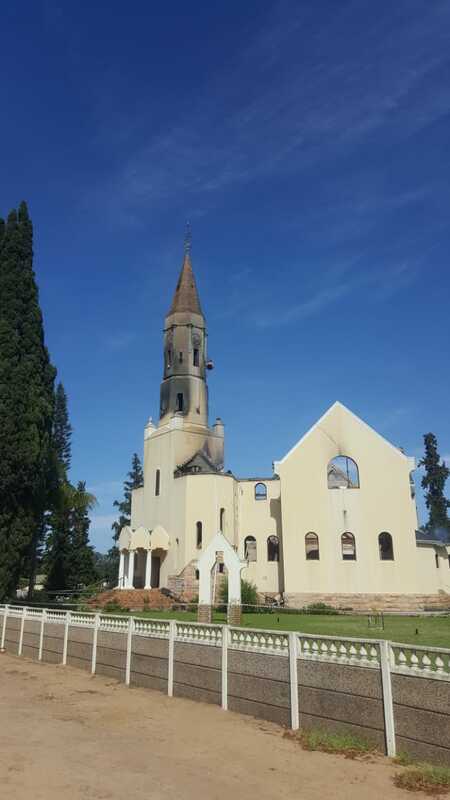 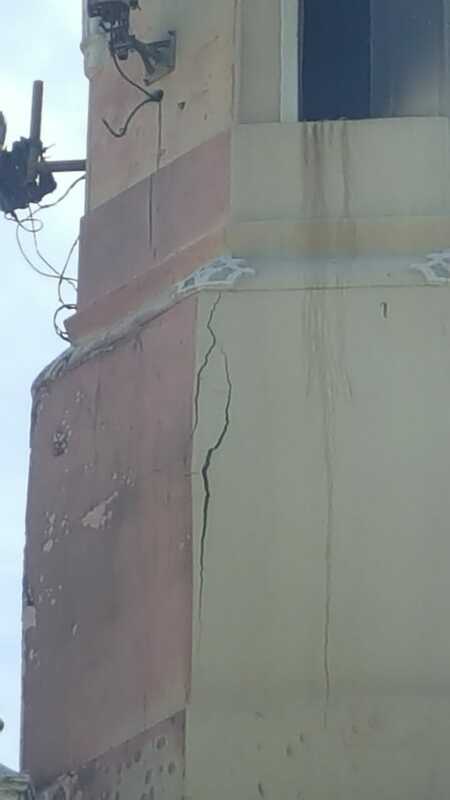 Local community leader Billy Claassen said that there was no cellphone reception in the town owing to the tower being destroyed. 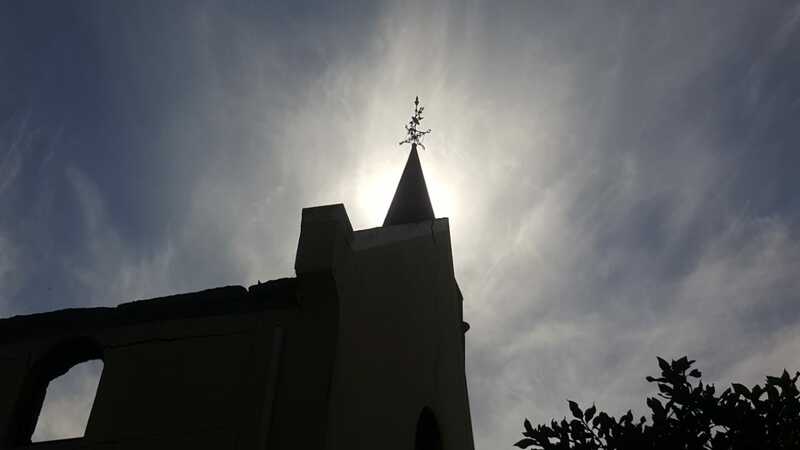 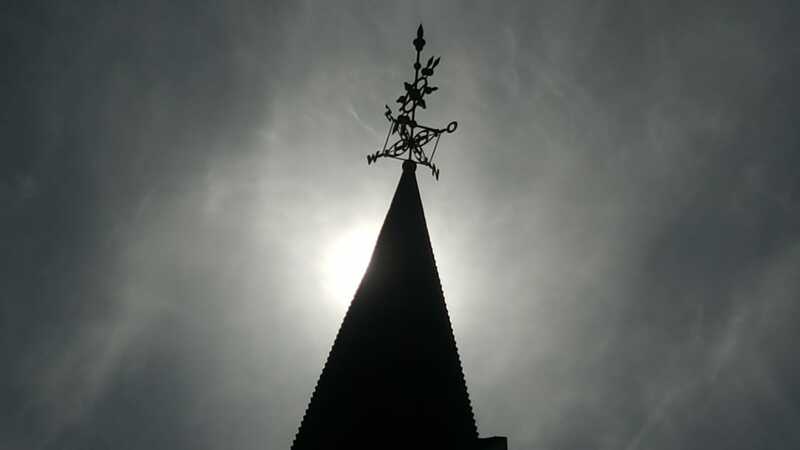 "The church tower housed cellphone transmitters of MTN and Vodacom, as well as internet service provider Openserve," Claassen said. 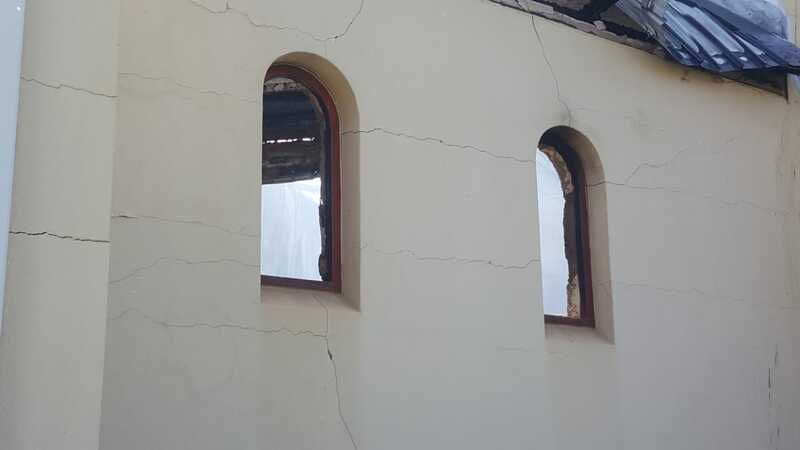 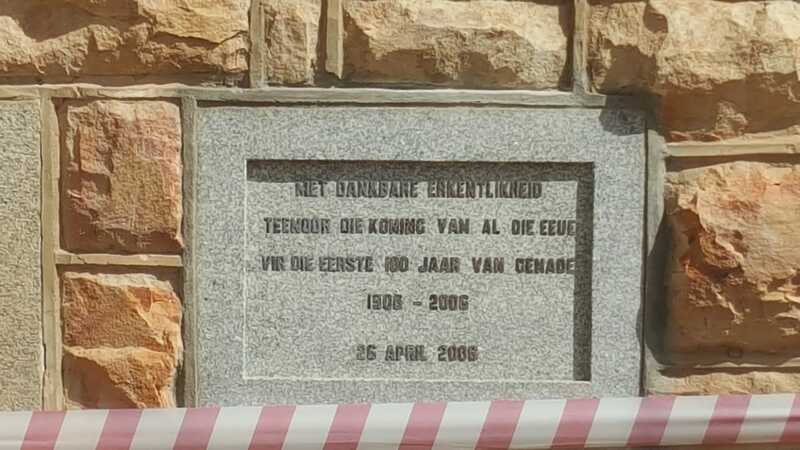 Senekal said the area had been cordoned off, as the building was considered unsafe and could collapse. 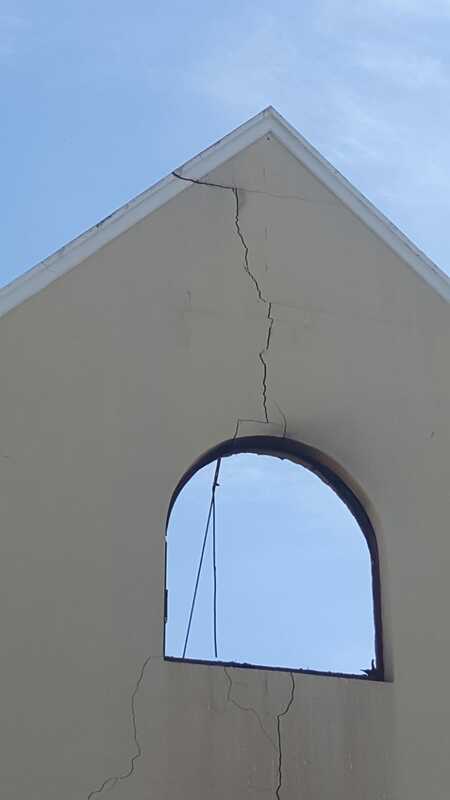 "There's a good chance that the weight of the bell will cause the tower to collapse, so we have closed surrounding roads as a precaution." 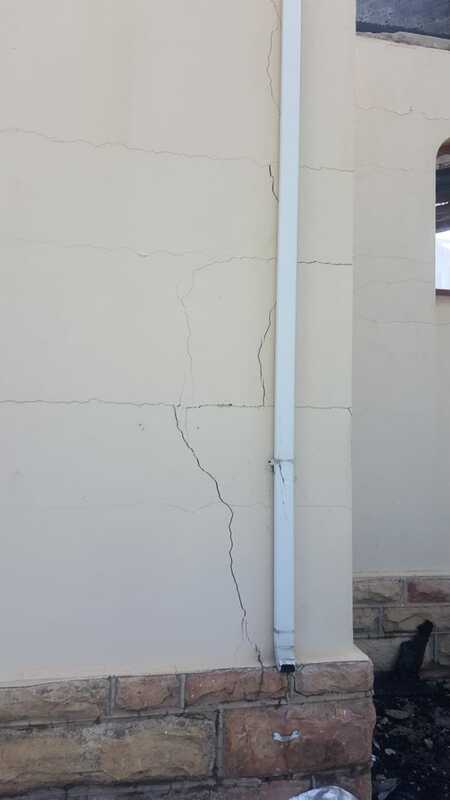 He provided photos of the damaged building that clearly show cracks to the structure. 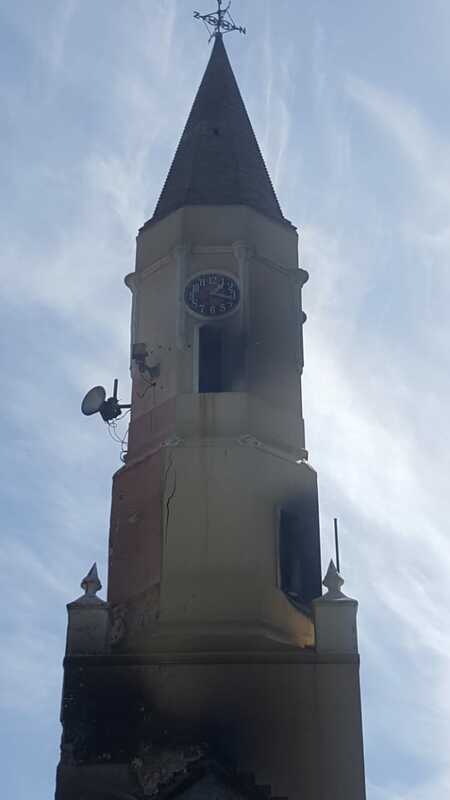 There is some hope that the clock tower will be declared safe and the new church can be built around it.